This tutorial covers the conventional gas furnace (up to 89% AFUE). For a tutorial that supplements this tutorial and covers issues unique to the high-efficiency gas furnace (90% AFUE and above), read up on troubleshooting a high efficiency condensing furnace. The heated air then cools down in your home's various rooms and returns to the furnace through return air grills and ductwork. The cold returning air enters back through the air filter into the furnace to complete another heating loop. Sometimes there is a humidifier mounted on the furnace or the return air ductwork. Furnaces come in different efficiencies measured in AFUE. Once in a while, things don't work quite right and you need to troubleshoot a gas furnace repair or relight a standing pilot if it has one. Conventional furnaces may have electronic ignitions, which need special troubleshooting. 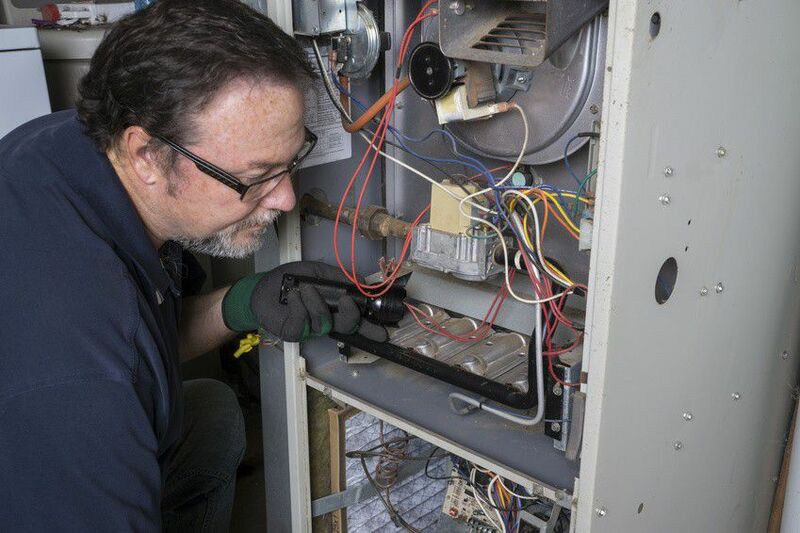 In any case, let's take a look at the more common problems and furnace repairs you may have to make with a conventional furnace. A pilot light can go out due to a strong draft, dirty orifice, or dirt in the gas tube. Luckily, relighting your pilot light is fairly simple. The thermocouple may also be faulty and shutting off the gas supply. If this is the case, the problem is a bit more involved and may require you to replace your thermocouple. Newer furnaces do not rely on a standing pilot to ignite the gas burners. Electronic ignition occurs typically in one of two ways: intermittent pilot or hot surface ignition. ​​The intermittent pilot system uses an electronically controlled high voltage electrical spark to ignite the gas pilot and, subsequently, the main burners when the thermostat calls for heat. The hot surface ignition system uses an electronically controlled resistance heating element, not unlike a light bulb filament, to ignite the gas burner. Learn how to fix the electronic ignition. Some common symptoms exhibited by your furnace may actually be due to a faulty thermostat. After you have confirmed that the furnace is not the problem, you'll want to check the thermostat. Problems can show up as a furnace that produces no heat, wild temperature swings, or cycling on and off too often.